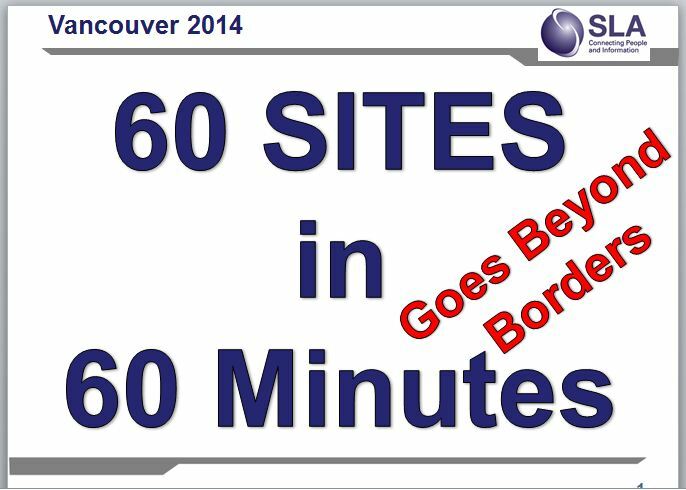 It was another big year for “60 Sites in 60 Minutes” at the 2014 Special Libraries Association Annual Conference & INFO-EXPO. Hosted by the Legal Division of SLA and generously sponsored by LexisNexis, the panel once again shared their top picks with a full house. From search sites to news, travel, and even a bit of irreverent fun, there was something for everyone! What sites made the cut? You can find out here. Presenting again this year were John DiGilio of iBraryGuy and ReedSmith LLP, Gayle Lynn-Nelson of LexisNexis, and Samuel Wiggins of Berwin Leighton Paisner LLP. This year’s theme, in keeping with the overall conference theme, was “Going Beyond Borders” and featured a healthy smattering of sites from around the world. Next year’s conference is in Boston, MA, and the theme is “Be Revolutionary”. Will 60 Sites return to revolutionize the way you enjoy the internet? Maybe! Stay tuned! This entry was posted in Conferences, Fun, News and tagged 60 Sites, LexisNexis, ReedSmith, SLA, SLA Legal. Bookmark the permalink.